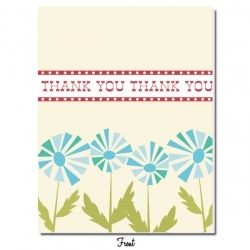 Show your appreciation for that special someone with our retro-inspired blue daisies. Thank them once. Thank them twice. They'll get the message. Other Info: Professionally printed on 100 lb satin finish paper. Each card measures 4.25" X 5.5".